For many educational, government and commercial organizations using one PC system with multiple monitors provides a lot of advantages when it comes to overall computerization. If you are going to allow multiple users work on 1 PC and reduce costs of equipping workplaces for employees, you've come to the right place! IBIK is ready to offer you professional ASTER software as an inexpensive and highly effective solution to share one PC for multiple users. As we know, one monitor usually comes coupled with one computer system and this type of setup is common in both home and office environments. Our ASTER shared computer access software allows creating a cost-effective multi-user system through sharing one PC between several users simultaneously. Basically, one computer system can be easily shared supporting work of multiple users on 1 PC as if they had their own independent computers. There is no necessity to buy additional computers or operating systems: after the installation of our powerful ASTER software, you can share one PC for multiple users just by connecting extra monitors, mouses and keyboards to the available shared computer. 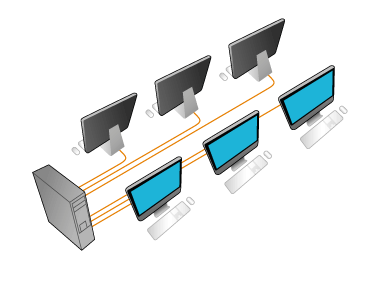 Moreover, when you run a PC with multiple monitors, you are able to support multiple users on 1 PC doing the same or different things simultaneously without influencing other users. ASTER has been successfully used to share one PC for multiple users in computer classes, accounting departments, offices, Internet cafes and other establishments. Setting up a PC with multiple monitors there will ensure the same functionality as with individual workstations, but at a much lower price.